In a rather bold move AMC has decided to officially greenlight a fifth season of its Emmy-winning, flagship series Mad Men without a deal in place for creator/exec-producer Matt Weiner. The network is exercising its option with the series’ producer Lionsgate TV and work will start on the new season shortly. While this may seem bold, and it is, it’s not unprecedented. In fact, AMC did the exact same thing two years ago when it was almost in the exact same position and negotiations with Weiner were dragging on. 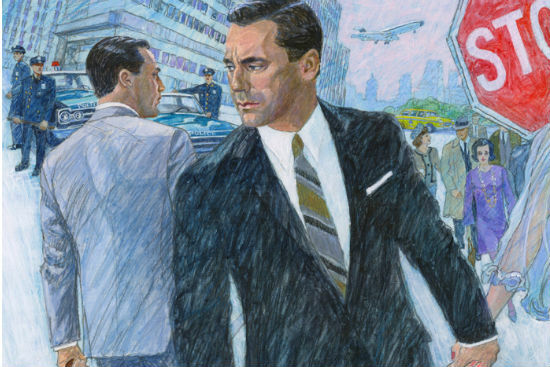 Sadly, even thought his may seem like good news for Mad Men fans, there’s at least one bit of bad. Because of the still unresolved negotiations with Weiner, the premiere of Season 5 is being pushed from the Summer to early 2012. While some may slam Weiner for holding things up the delay isn’t all about money, at least not directly for him. His part of the deal is reportedly already in place, which would make him the highest paid showrunnner on TV with close to $30 Million for two years. The delay has more to do with creative elements of the show. As blown away as we were when Fox released the very first trailer for X-Men: First Class about a month ago, we didn’t get to see as much as we wanted. Thankfully, we’re getting more and more as we get closer to the release date, and now in the form of a Russian trailer. Sure, the dialogue and titles are in a backwards demon language, but we get a more in-depth look at Beast’s transformation, more young Magneto, and a few great shots of the Hellfire Club. The film is set to take place long before the events of 2000’s X-Men, when both Professor Charles Xavier and Eric “Magneto” Lensherr meet for the first time and decide to help their fellow mutants by forming a school and a covert team. The film stars James McAvoy, Michael Fassbender, Kevin Bacon, January Jones, and a whole slew of young stars as the very first generation of the X-Men. Check out the new trailer after the jump, and see X-Men: First Class in theaters on June 3rd. ‘X-Men: First Class’ Trailer Goes Live! And In HD! Earlier today, we brought you news that 20th Century Fox was bringing Facebook fans the very first trailer for Matthew Vaughn’s upcoming X-Men: First Class. Well, without further adieu, we’re bringing it to YOU. Check it out below and let us know what you think. Starring James McAvoy, Michael Fassbender, January Jones, Oliver Platt, and Kevin Bacon, X-Men: First Class is set to hit theaters on June 3rd. Were you as upset as the rest of us when we sat through all of the commercials on Super Bowl Sunday and didn’t get a single glimpse at Fox’s upcoming X-Men: First Class? Well good news! If you have Facebook, then Fox is making it up to you! Starting later today, 20th Century Fox is rewarding anyone who like their X-Men Movies fan page over at Facebook.com/XMenMovies by giving them the first exclusive look at X-Men: First Class. That’s right, all you have to do is like them. Sounds simple, right? For those of you who aren’t caught up to speed on the film itself, here’s a tidbit. X-MEN: FIRST CLASS charts the epic beginning of the X-Men saga, and reveals a secret history of famous global events. Before mutants had revealed themselves to the world, and before Charles Xavier and Erik Lehnsherr took the names Professor X and Magneto, they were two young men discovering their powers for the first time. X-Men: First Class is set to hit theaters on June 3rd.